We have a number of MicroGate UTabLED 16×96 displays. We like them very much as they are readable, portable (we work in a number of different locations a week) and weatherproof. Lynx ships with several .lss (Lynx Scoreboard Scripts) that work the scoreboard. We dislike each of them for one reason or another. Example, the standard script that uses fixed positioning places the names right justified, so many names are simply off the screen. And the lane digits are left justified meaning that when you go from single to double digits, the numbers jump over a column. Your guess is as good as mine what each piece of code means … there is some explanation, for example a line that starts with \02 is a lane and \04 is the name, but what does the rest mean exactly? A minus after the percent, I think, means left justified and no minus means right justified. I think that the 2.2 means two characters starting at position two, but I’m really not certain and I can’t find any documentation. If you can please let me know. Anyway, with our rudimentary understanding of what various things do, and with a WHOLE lot of trial an error, we have a script that we like much better. The lanes are left justified, we add a period to separate the lane and name (easy to remove if you wish) and for results we sort of take what we liked about the split height scrolling script and made it fixed so that time is top right and name is at the bottom with place to the left in larger font. See what you think, and if you can possibly figure out what the code means so that we can better tailor scripts, feel free to share! I will post videos of it in operation on facebook and they are linked to above. Simply save the file to your Lynx folder on the C drive (c://Lynx) if you take the .lss or change the extension from .txt to .lss if you take the text version. 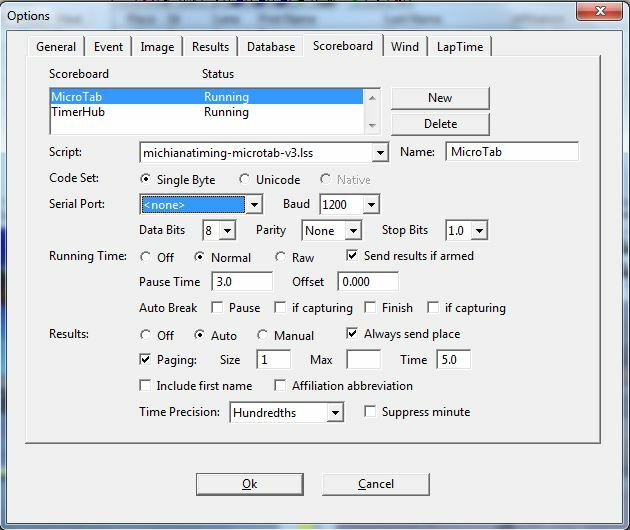 In your scoreboard script, pick this script in the drop down and you should be good. Note that you must load Lynx after you save the script or it will not be in the drop down. We sell ALL LYNX PRODUCTS and provide support and training for Lynx products. If you need a quote on anything, please let us know.